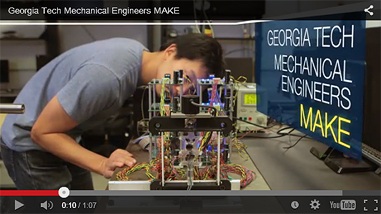 What do Georgia Tech mechanical engineers make? The Capstone Design Expo has become the largest academic event on the campus calendar and perfectly sums up what Georgia Tech is all about — students using hands-on knowledge to tackle real world problems. The 2015 spring edition took place on April 23 in McCamish Pavilion and included 198 projects designed by 1040 students from 11 disciplines across three colleges. This is the time of year when high school seniors and their parents are agonizing over their choice of a college or university. We believe that we have among the very best undergraduate mechanical, as well as nuclear, engineering programs in the country. 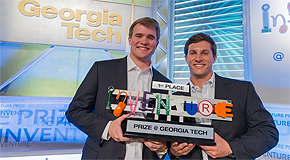 Georgia Tech students, Scott Schroer (mechanical engineering), Will Sweet (business administration), and Alex Roe (computer science), invented the FlameTech Grill Defender. It's a safety device for gas grills that alerts users when gas levels have reached an unsafe threshold. 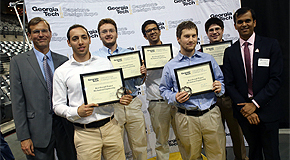 They won the 2015 InVenture Prize, which includes a $20,000 prize and a free U.S. patent filing by Georgia Tech's Office of Technology Licensing. Jennelle Piepmeier (PhD ME '99) was recently promoted to (Full) Professor at the United States Naval Academy (USNA), to be effective mid-August. 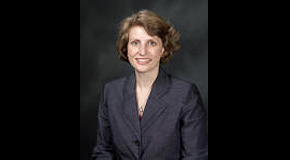 Dr. Piepmeier was a graduate student in the Woodruff School from 1993-1999 under the advisement of Dr. Harvey Lipkin. She speaks highly about her experience at Georgia Tech and how it prepared her for the U.S. Naval Academy. We are winding down the 2014-15 academic year and it’s been quite the award-winning last month for many of our students.